Asheville, you only have two more weeks to get Vijay Shastri’s fried chicken and grits. 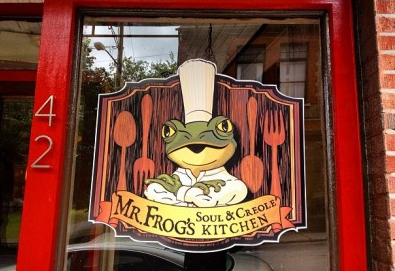 Mr. Frog’s Soul and Creole Kitchen will serve its last plate of food on New Year’s Eve. “And we’ll spend the remaining time getting our equipment out of here, closing all this stuff down, and hopefully, sometime in the off season, we’ll start looking at other places,” Shastri said. The food at Mr. Frog’s is delicious. Get by before Vijay closes and wish him luck on his new venture. Click over to read the full story. Yeah, I’m sure I’d be getting their very best, with two weeks notice!